Our ever popular Jack the Joker fundraiser continues this Sunday night in Minnies Bar where the jackpot is €2400 as on Sunday night Liam Morrissey was drawn out of the drum and chose card number 5 which when turned was not the joker but he did win €50. The Walsh family and Roisin Hurney won €25 each. 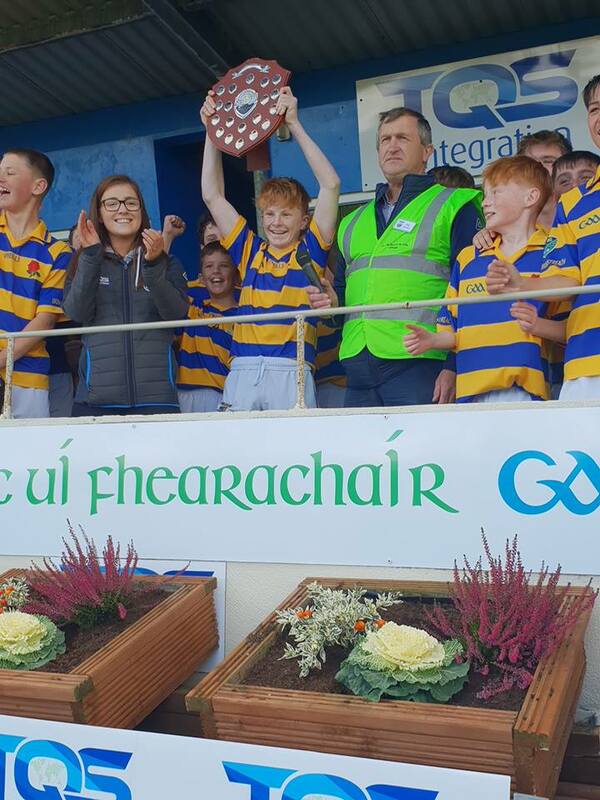 On Sunday morning last our under 21 hurlers defeated St Carthage's in the semi final of the Western Championship. This Sunday they take in Cois Bhride in the Western Final in Fraher Field at 13:30. TEAM: A. BERESFORD, C. McCARTHY, J. ELSTED, D. MONTGOMERY, M. TWOMEY, D. McGRATH, J. BERSFORD, T. LOOBY, C. PRUNTY, S. WHELAN BARRETT, N. MONTGOMERY, D. BREATHNACH, E. KIELY, K. DWANE, M. KIELY. On behalf of all in the club we would like to thank all those who supported our dog night in Kilcohan Park last Saturday night. 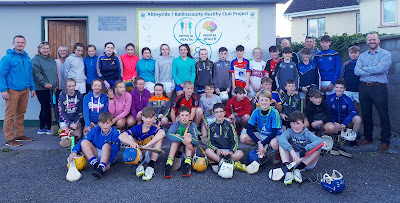 To say the night was a great success would be an understatement and must thank the small group of people who helped to organise the night and made sure everything ran so smoothly. It was great to see some local success on the night as Mrs Margaret Enright had rep winners and congratulate Margaret on her success. 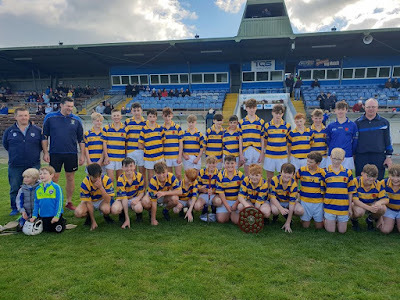 Three weeks after winning the county hurling title, our U14 footballers completed the club's first ever county double at this grade with a hard fought 4-8 to 2-5 victory over Gaultier in the County Final Replay at Kill this afternoon. Playing against a very strong wind in the first half, our boys trailed by one point at the break, 2-4 to 2-3. Two early second half goals along with 5 points in the final quarter secured victory. Congratulations to all the players, mentors and backroom team on a fantastic 2018. Our ever popular Jack the Joker fundraiser continues this Sunday night in Minnies Bar where the jackpot is €2200 as on Sunday night Kitty Farrell was drawn out of the drum and chose card number 29 which when turned was not the joker but she did win €50. Peggy Walsh and Nora and Billy won €25 each. 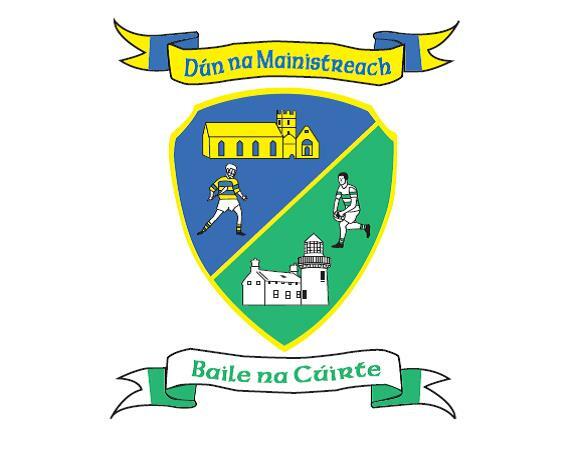 On Saturday night last we took on Ballinameela in the Semi Final of the Western Championship in Fraher Field. At the end of a tough game it was our opponents who emerged victorious. We thank the players and management team for all their commitment during the year. TEAM: K. DWANE, G. BREEN, D. HENLEY, D. MONTGOMMERY, P. COLLINS, P. LYNCH, C. FAGAN, D. HICKEY, S. AHERN, J. MULLEN, E. COLLINS, M. MAHER, R. RYAN, A. BERESFORD, S. O’DONOVAN. SUBS: P. POWER, E. KIELY, L. HURNEY, M. FIVES. 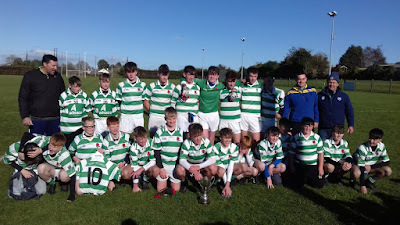 Our Senior Football team exited the championship on Sunday last when we were defeated by The Nire in the County Semi Final in Fraher Field. Whilst defeat was our lot on the day theplayers and management team can be very proud of their efforts not just on Sunday, but indeed all year and we thank them for their commitment. TEAM: S. ENRIGHT, J. ELSTED, C. PRUNTY, D. McGRATH, D. COLLINS, B. LOOBY, S. O'HARE, J. HURNEY, J. BERESFORD, N. MONTGOMERY, R. FOLEY, S. WHELAN BARRETT, P. HURNEY, M. FERNCOMBE, M. O'HALLORAN. SUBS: G. HURNEY, J. O’MAHONY, C. McCARTHY. On Saturday October 27th we are holding a fundraising Night at the Dogs in Kilcohan Park. This promises to be a fantastic night and we appeal to all our supporters to please come along and make the night a huge success. Tickets cost €10 and are currently on sale from all players and committee members. We are also running buses on the night so please let any committee member know if you wish to travel by bus on the night. If you wish to travel on the bus please contact Tomás Kiely to book your seat. Jack the Joker – Jackpot Won!! Our ever popular Jack the Joker fundraiser continues this Sunday night in Minnies Bar where the jackpot is €2000 as on Sunday night Aoife Cosgrave was drawn out of the drum and chose card number 26 which when turned was indeed the joker meaning she claimed our Jackpot of €6000. Mickey Organ and Kieran, Darragh and Laura Cosgrave won €25 each. This weekend is a big weekend for our football teams as they both seek to claim a place in the finals of the championship. 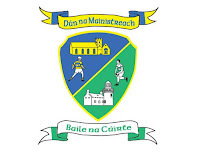 Firstly on Saturday night our Intermediate team play Ballinameela in Fraher Field at 7pm in the divisional semi final. Then on Sunday our Senior team play The Nire in the County Semi Final in Fraher Field at 2pm. Please come along and show your support for both teams. Don’t forget this weekend is the last chance to order club leisure wear. We have a selection of coats, crew neck tops and zip tops available all of which make an ideal Christmas present. Our club bingo session continues in the CBS Hall this Sunday night with a jackpot of €1100. We would like to acknowledge and congratulate our members Hannah Walsh and Aoibhin O Grady on their achievements at County Level. 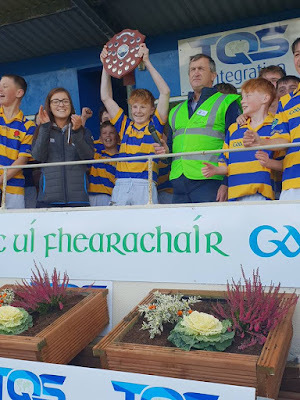 Hannah was on the panel while her father Richie was part of the management team for the Under 16 Waterford Camogie team who won the Munster Championship. 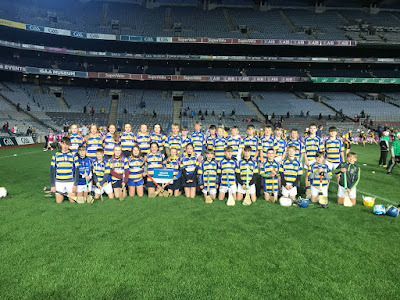 Aoibhin O Grady was a member of the All Ireland Division B Under 14 team and she recently received her medal from Niamh Rockett and Beth Carton. Congratulations to our U14 players and management team on their superb 2-14 to 1-10 victory over Ballygunner in the Division 1 County Hurling Final played at Farher Field this afternoon. Playing with a strong breeze in the first half the boys raced into an early lead before going in at the break leading by eight points, 2-7 to 0-5. A fantastic battling second half, where our lads contested every ball, ended with a seven point win. A truly wonderful performance from a great group of players. This weekend is a massive one for our club. We face two county hurling finals against Ballygunner on Saturday and Sunday in Fraher Field. 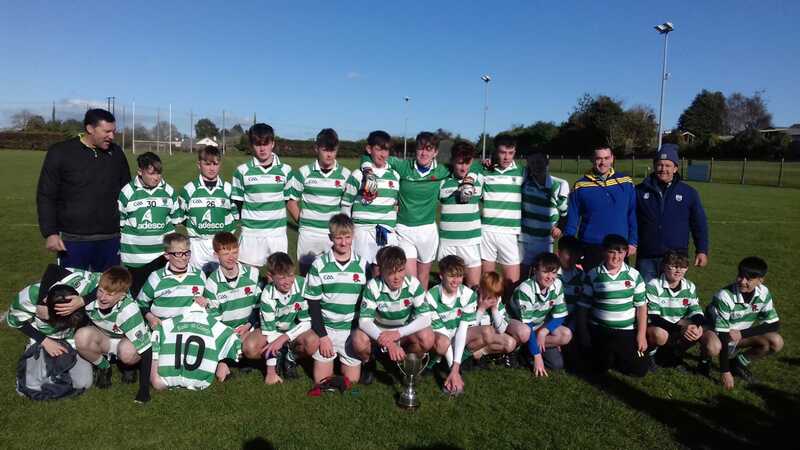 Our U14 team are first in action on Saturday at 1:00pm. Then on Sunday our seniors take on the reigning champions in the Senior Hurling Final. Throw-in time is 3:30pm. Best wishes to both. We appeal to our loyal supporters to cross the bridge and shout on the boys over the next two days. 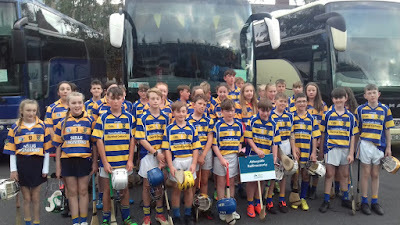 Sunday Sept 30th saw 33 boys & girls from the Abbeyside GAA Club enter the Guinness World Record Books when they participated in the Largest Hurling Lesson which took place in Croke Park. The previous record stood at 577. Tickets scanned we entered the pitch with 40 plus clubs from around the country. 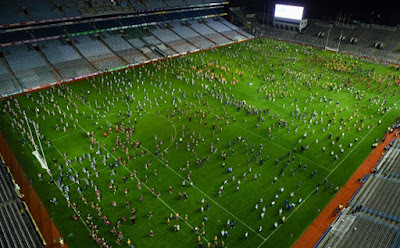 The hooter sounded for the start of the record attempt, 20 drills and 30 minutes later the hooter ended the session. Back up to our seats in the Cusack Stand where we waited for the news, the record was smashed when the Guinness World Record adjudicator on the night announced that 1,772 kids trained all at the one time and for the 30 minutes required. Valid attempt and great excitement greeted the announcement, well worth the trip and a great day was had by all. 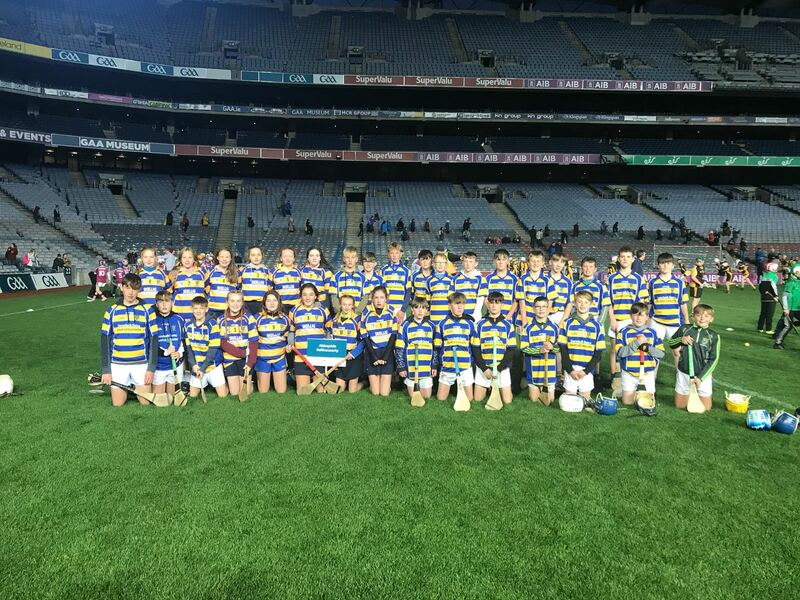 Well done to all who helped make this a great memory for the boys & girls.